The flower buds of Paeonia Elsa Sass, the last blooming white peony, are an unforgettable sight; the buttons are bright white and have a diameter of more than 50 mm. Elsa Sass is a double-flowered peony with flowers that grow in the shape of a rose with petals that are round and coarse. 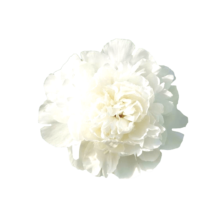 Elsa Sass, along with Madame Claude Tain, is the whitest peony in our assortment. The stems are short, but thick and sturdy. The dark green leaves contrast nicely with the snow white colour of the fantastic smelling flowers. Elsa Sass was registered in 1930 and won the gold medal of the American Peony Society in 1943. The breeder of this variety, the famous Henry Sass, named it after his wife. He also named a variety after himself, but unfortunately for Henry, the peony variety Henry Sass is nowhere near as popular as the one named after his wife. Elsa Sass must be harvested when the buds are already showing colour, otherwise chances are they will not bloom. They must be completely white and soft and you must be able to have a peek inside when you squeeze them.